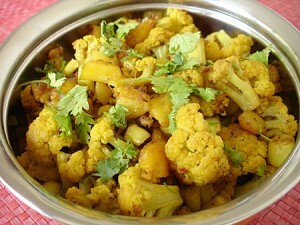 Aloo Gobi Masala recipe by Tahseen at DesiRecipes.com. 1 lb potatoes, cut into medium chunks. Chopped fresh coriander, to garnish. Boil the potatoes in a saucepan for 10 min drain and keep aside. Heat oil in large heavy based frying pan and fry cumin seeds and add chilli and fry for 1 min. Add the cauliflower florets and fry ,stirring for 5 min. Add the potatoes and ground spices and salt and cook for further 7-10 min, or until the vegetables are tender. garnish with fresh coriander. Today I made dal thadka and aloo gobi curry my family loved it so. All your recipes are 5 stars EXCELLENT thanks for your blog. this is totaly rubbish u even dont know how to play with veges u dumbo poo head!!!!!!!!! !